While New Delhi and Beijing have been engaged in finding ways to resolve the long-pending boundary dispute, the BJP’s training document tells its cadres that China was “not interested” in a resolution. Although New Delhi and Beijing have taken initiatives to “reset” bilateral ties in recent months, the BJP’s training material for its cadres continues to describe China as a “threat” to India and Indian interests. The training material has been prepared for BJP workers across the country under the party’s Pandit Deen Dayal Upadhyay Prashikshan Mahaabhiyan (mega training programme), 2018. “China and Pakistan both have nuclear weapons and have developed close diplomatic relations to impede India’s growth as a global power,” reads one of the booklets released by BJP president Amit Shah on June 13. 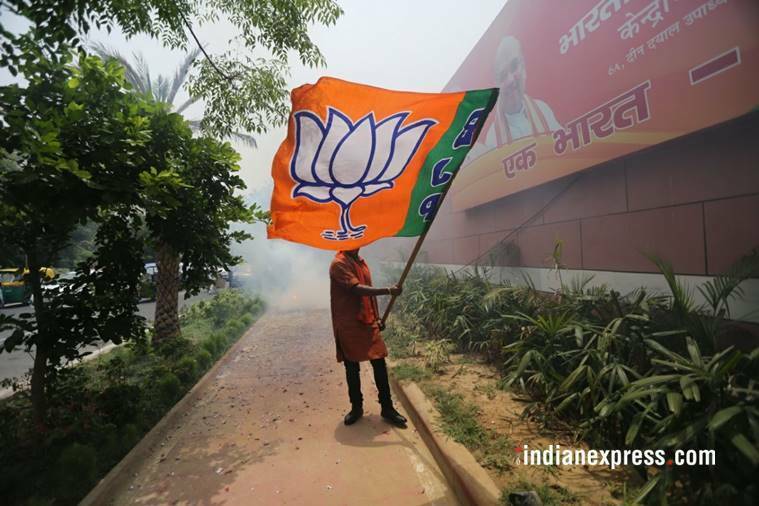 Separate booklets have been prepared for the party’s Mahila Morcha and Kisan Morcha wings — Mahila Morcha Prashikshan Praroop and Kisan Morcha Prashikshan Praroop — but their assessment of China, included in the chapter on Rashtra ke Samaksh Chunautiyan (Challenges Before the Nation), is similar. “The external challenges are greater from neighbouring countries. China, especially, presents major challenges from the strategic (saamrik) point of view. Pakistan is consistently targeting our unity and our economy,” it says. While New Delhi and Beijing have been engaged in finding ways to resolve the long-pending boundary dispute, the BJP’s training document tells its cadres that China was “not interested” in a resolution. “It appears that China is not interested in resolving this issue. Although no firing has taken place on the border after 1962, and no major tensions have erupted either, China is constantly stockpiling ammunition on the border… Recently, China supported Pakistan on a proposal in the United Nations regarding Lakhvi (26/11 mastermind Zaki-ur-Rehman Lakhvi)”, says the booklet. China, it adds, was also strengthening its Navy, which poses a threat to Indian naval interests. “By developing a web of roads along the border, China is in one way helping Pakistan and Sri Lanka. That is creating a strong challenge for the dominance of India in Hind Mahasagar,” it says. It adds that while India has always maintained a spirit of economic cooperation with China, that country has consistently disregarded India’s economic interests. Among the “Internal Challenges”, the booklet lists Maoists, who it says are receiving support from Pakistan and China. “Pakistan aur China se lagaatar sahayta prapt kar rahe Maowadi Bharat ke aantarik suraksha ke liye khatra ban gaye hain (Maoists who are receiving help from Pakistan and China, have become a threat for the internal security of the country). “Separatist outfits active in the Northeast are carrying out anti-India activities from hideouts in Myanmar and Bangladesh,” the booklet says. While references to China fly in the face of diplomatic efforts made by India to rebuild ties that were hurt by the Doklam standoff, on Pakistan, the BJP booklet echoes the government’s stated view on Pakistan-sponsored terrorism. “The whole world has acknowledged that Pakistan is the birthplace of terrorism and it is sending terrorists across the world. Pakistan is running terror camps near the Indian border. It is not just giving shelter to anti-India terrorists like Dawood Ibrahim and Tiger Memon, it is also defying all agreements for peace,” reads the booklet. The same chapter has a section on “Jabran Dharmantaran” (forced religious conversions), which alleges that other countries were backing conversions in India. “Religious conversion is a politically sensitive matter because various political parties in India are either promoting religious conversions or silently giving support to it,” reads the booklet.